Earlier today, there were spy shots of the new Honda City floating around on the Interweb, and now the Japanese car manufacturer has launched the car in Thailand. The refreshed Honda City sedan retains the silhouette of the outgoing car but looks a tad more grown-up than before. The 2017 Honda City gets new front and rear bumpers. The headlamps are all LED units, inspired by the ninth-generation Accord, and also come with LED DRLs (standard). The fog lamps too are LEDs on the higher trims. The grille is also new and has a honeycomb mesh. The front spoiler lip also protrudes out, giving the car a sporty appearance. Honda has also given the hood a sculpted appearance. While the sides look the same, the alloy wheels look sporty. At the rear, the lamps have been given an LED effect. Inside the cabin, there is the gunmetal-accented dashboard and new upholstery for the seats. LEDs seem to be the theme here as well with an interior reading lamp as well as map lights being of the same breed. The touchscreen infotainment system is being claimed to have been improved for feel and is compatible both with iOS as well as Android phones. Honda has continued with the same 1.5-litre Earth Dreams petrol and diesel units; however, they have been tuned to be Euro-VI compliant. Honda claims a fuel efficiency of 17.9kmpl with the CVT and 18.2kmpl with the manual petrol engine in Thai driving conditions. While dual airbags and ABS are standard across the range, side and curtain airbags, vehicle stability assist, hill start assist and a multi-angle rear-view camera will be offered in select variants. 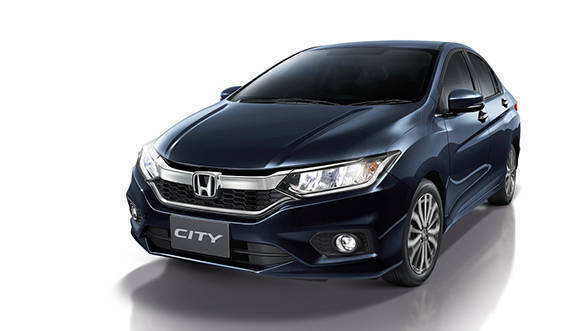 Expect the new Honda City to be launched in India in the first half of this year. Prices should go up by around Rs 25,000 depending on trims. After the launch of the Maruti Suzuki Ciaz, sales of the Honda's bread and butter model did take a hit. It will be interesting to see how the new City fares against the facelifted Ciaz (expected this year as well).